Rush Hour traffic In Subang Jaya, Kuala Lumpur, Malaysia. Photo: Jason Thien. Creative Commons BY 2.0. Life without roads is unimaginable for today’s urban citizens. Roads provide access to work, school, food, and entertainment. They provide vital support for our economy, and they connect the daily habits and needs of communities. So, when they fail us and traffic builds up, congesting daily life, the go-to solution is to build new roads. The common thinking is that if roads are too crowded, more roads must be the answer. 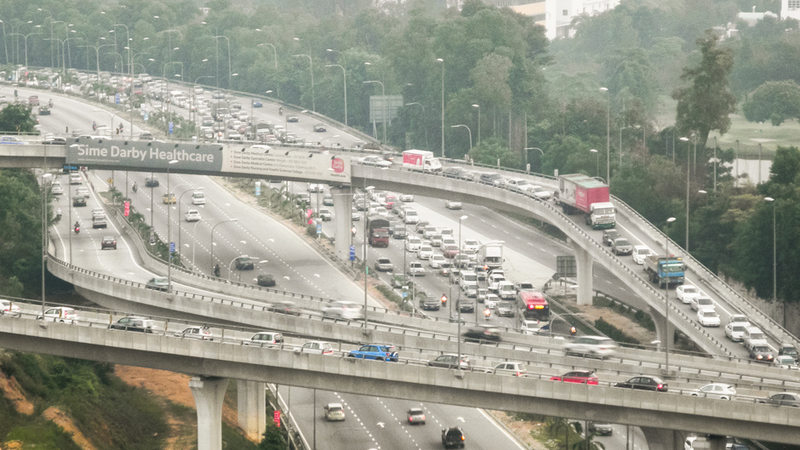 A recent editorial in the Malay Mail, “Feasible transport master plan requires an efficient road network,” takes this view. It touts the benefits of the Penang Transport Master Plan and questions whether more roads really leads to more cars. Free debate is essential to a functioning society, and there are plenty of good reasons to support sensible improvements to our roads and infrastructure. But yet, in this fact-challenged modern world, we must not turn our backs on what experience has repeatedly shown to be true — that more roads are rarely the solution. First, it has been noted since at least 1930 that an increase in the number of roads leads to more cars. This has been observed hundreds of times in cities around the world, and is well-established among researchers, urban planners, traffic engineers, and car manufacturers alike. No doubt, extending the road network temporarily relieves traffic congestion and reduces travel times. However, it also provides an incentive for drivers to make more trips, so that congestion increases again over time. New roads — especially those linking suburban areas to city centres — also encourage people to live in cheaper housing, further from their jobs in the city, thus increasing the length of trips. The resulting urban sprawl reduces the viability of public transit, which is most effective in smaller, dense environments. This, in turn, further increases reliance on cars and demand for roads. The car-sharing economy is not a solution either, adding 2.6 km of driving for every 1 km of personal driving replaced. Second, this vicious cycle of traffic congestion and road-building comes with high costs for social equality, especially burdening those who can least afford it. Those who cannot afford cars face long travel times to access services, education, and jobs. Some of these people may turn to lower-cost motorcycles to meet their needs, which increases the risk and severity of traffic accidents. The vulnerable among us are left behind, and mobility becomes more dangerous for us all. Third, by designing our cities around the needs of personal vehicles, widening roads and removing traffic obstacles, we undermine the mobility of pedestrians, bicyclists, and those who use public transit. Most Malaysians will agree that walking is a challenging option in our cities. There are pedestrian barriers instead of pedestrian crossings, cars parked on sidewalks, and the constant rush of traffic. Fourth, increased dependence on cars impacts the health of every urban citizen. Traffic is a major contributor to urban air pollution, increasing risks of respiratory and cardiovascular illnesses and other non-communicable diseases (NCDs). More and longer road trips means more accidents and more stress — and stress-related illness. When driving is the only feasible transport option, physical activity plummets. In Malaysia, this has contributed to the highest rate of obesity and overweight in Southeast Asia — 51.2 per cent. The rise of NCDs carries heavy economic costs for Malaysia, with direct medical costs for diabetes alone accounting for RM2 billion in 2011. Finally, the road-dominated transit system shapes our mindsets. As pointed out in “Feasible transport master plan requires an efficient road network,” roads are not the only factor that promotes private car use. Car use results from “the convergence of institutional, social, economic, political, and personal factors.” Yet the decision to prioritise road infrastructure creates incentives and feedback loops that deeply influence these very factors. Once car use is entrenched in our social fabric, we lose sight of other possibilities in politics and in our daily lives. We accept the resulting social inequities and health impacts as the necessary cost of a healthy economy. Evidence from around the world, however, shows that this is plainly not true. Highly liveable cities — such as Vienna, Seoul, Zurich, and Paris — have excellent pedestrian, cycling, and public transit options. Not only are they highly attractive places to live and work, but they are economically successful, at least in part because of their integrated approach to mobility. Advanced cities around the world are following their lead in building sustainable cities and communities. By emphasising transportation alternatives to private cars these cities are creating a path to health and sustainability. As we work toward these models, it is not sufficient to add alternative transit options onto existing urban settings. We must also stop unthinking expansions to our sprawling road networks. Instead, we should holistically integrate all aspects of urban planning — especially roads — as we create alternative options for mobility. Only then will we improve people’s daily lives and well-being and build the cities Malaysians want and deserve. As long as we unquestioningly accept roads as the easy answer for issues of urban congestion and economic growth, we will ignore the long-term land use, social equity, and, indeed, mobility problems we are creating. If we want sustainable, equitable, and healthy cities — in Penang and throughout Malaysia — roads must stop being our sole solution. They are just one of many tools for improving the lives of urban citizens — a tool we need to consider and use with caution. This article first appeared in Malay Mail. Dr David Tan is a Research Officer with the United Nations University International Institute for Global Health focusing on green infrastructure and urban health. He has a PhD In Civil Engineering from the University of Minnesota. Dr Jose Siri is a Research Fellow at the United Nations University International Institute for Global Health. He is an epidemiologist focusing on infectious disease transmission, systems thinking and global urban health. Fatima Ghani is a Postdoctoral Research Fellow at the UNU International Institute for Global Health. Her doctoral research in social epidemiology used data from a large multilevel longitudinal study called HABITAT to identify the social and physical changes required to mitigate gender and age inequalities in recreational and utilitarian walking within neighbourhoods. Her research was part of the broader efforts conducted by the Centre of Research Excellence in Healthy, Liveable Communities to inform the development of ecological interventions that support active living and ageing communities, funded by Australia’s National Health and Medical Research Council.